Refer a Friend to Energy and Capital. 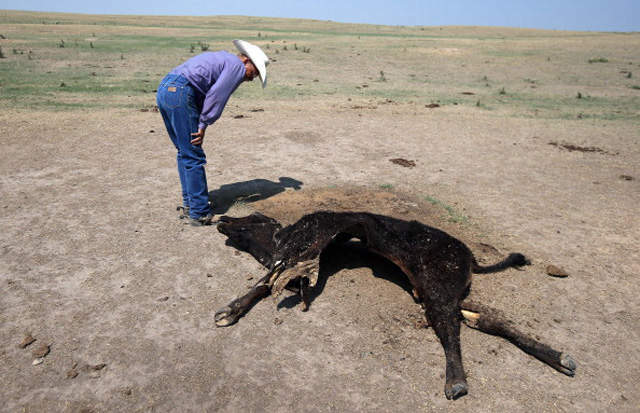 It’s been labeled the worst U.S. drought in more than fifty years. Crops have been wiped out, farms have gone under, and herds of cattle and pigs have been destroyed because there simply hasn’t been enough low-cost feed available to keep them alive. Of course, if you really want to dive into the issue, the fact that we continue to feed our cows and pigs things neither God nor evolution ever intended them to eat places the burden of blame on our shoulders. If we’d chose to shun the centralized industrial farming machine and embraced local farmers that let their cows and pigs graze on grasses and other natural feedstock (pigs love acorns, roots, and bugs) as mother nature dictates, the lack of corn and soy would not have nearly the impact it had on our overall food supply last year. These days nearly all cattle and pigs raised for human consumption are fed steady diets of industrially-grown corn and soy. So when the drought hit us last year with all the subtlety of a brick to the face, we found ourselves in quite a jam. And thanks to a government-mandated renewable fuels standard that requires 36 billion gallons of renewable fuel must be used per year by 2022, last summer’s drought crisis was actually amplified. This tiny company holds 13 patents and has perfected a process that makes the water used in fracking 100% reusable. And if that weren’t enough, they do it at half the price of their nearest competitor. Learn all the details on this and two other major fracking profitmakers. Click here. Despite an avalanche of requests from Midwestern states and meat industry groups to waive ethanol mandates during the drought, the EPA did not relent, saying it had not found evidence to support a finding of severe economic harm that would warrant granting a waiver. According to the National Drought Mitigation Center, damage estimates from last year’s drought were as high as $150 billion. And these numbers will only continue to rise as more than half of the nation (58%) is still getting battered by drought conditions. Brian Fuchs from the National Drought Mitigation Center has reported many areas are going to go into this spring planting season with a deficit, saying we are seeing it already with winter wheat, and it is likely to continue. Nah, this isn’t severe economic harm… right? I tell ya, the EPA is so clueless on this one. The organization that is charged with environmental protection is doing the exact opposite by maintaining the renewable fuels standard during this drought crisis. And make no mistake about it; this is a crisis. A couple of weeks ago, the Obama administration proposed a 9% increase in the renewable fuels standard. So we’re still in full-scale drought mode… farmers lost crops and livestock in record numbers last year — and are likely to match or even break those records in 2013… and the government is suggesting we actually increase the amount of corn going into our gas tanks. Most of these biofuel plays tend to be very risky, and I suspect continued supply constraints this year are going to further pressure margins. Jeff is the managing editor of Power Portfolio, an independent investment research service focusing primarily on stocks in the modern energy and infrastructure markets. He has been a featured guest on Fox, CNBC, and Bloomberg Asia, and is the author of the best-selling book, Investing in Renewable Energy: Making Money on Green Chip Stocks. For more on Jeff, go to his editor’s page. Did Obama Find a New Green Sucker?